#1 Why Should You Make a Change? The Real Estate industry has dramatically changed in the last fifteen years. Because of the internet, consumers have more options. More discount brokers are entering the market because of the evolution in the industry towards online listings and online marketing. Real Estate Source, Inc. takes advantage of this trend and allows you to maximize your commission and earning potential in today’s market. We help you meet the demands of today’s and tomorrow’s consumer in a way that’s most beneficial to you and your clients to maximize your profitability and customer satisfaction. #2 Why is a Flat Fee Broker the Future of the Industry? 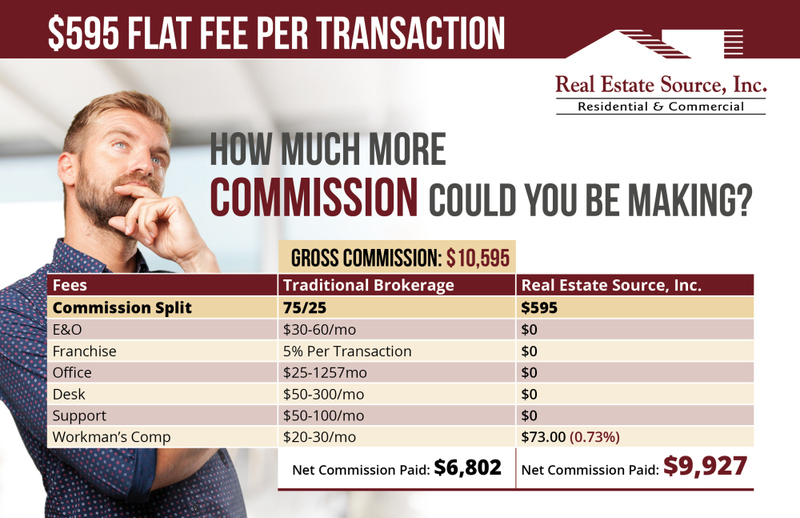 More and more agents are realizing that their commission structure and the money taken from them each year is not related to increased income or business revenue. 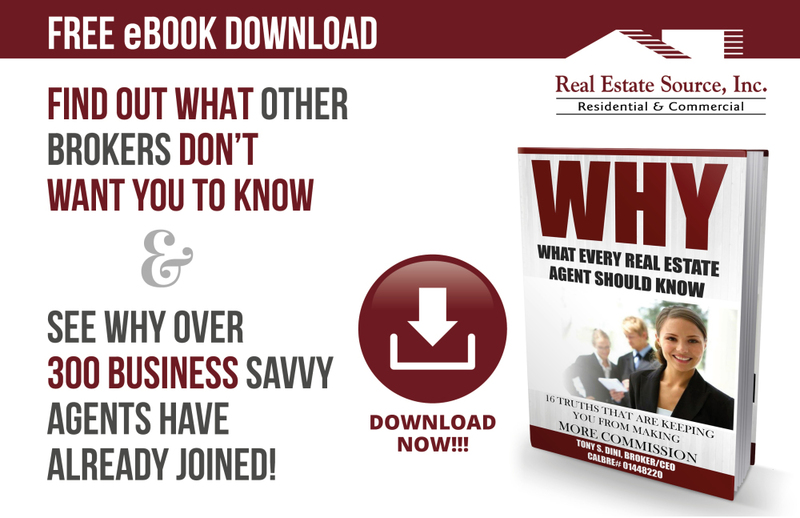 More agents are realizing that they are the ones in charge of their business and that buyers and sellers are trusting them and their knowledge to make the biggest purchasing decision of their life, not the name brand of the brokerage. It allows you to compete with the growing demand of consumers who have become financially wise and looking to maximize profits with the rapid growth of discount brokers. This is changing the face of the real estate industry. ​ WE DARE YOU TO TAKE THE CHALLANGE! As a company, we have thrived at expanding our services to agents and consumers in California's major metropolitan areas. We are active in all areas that have have strong growth and economic stability. 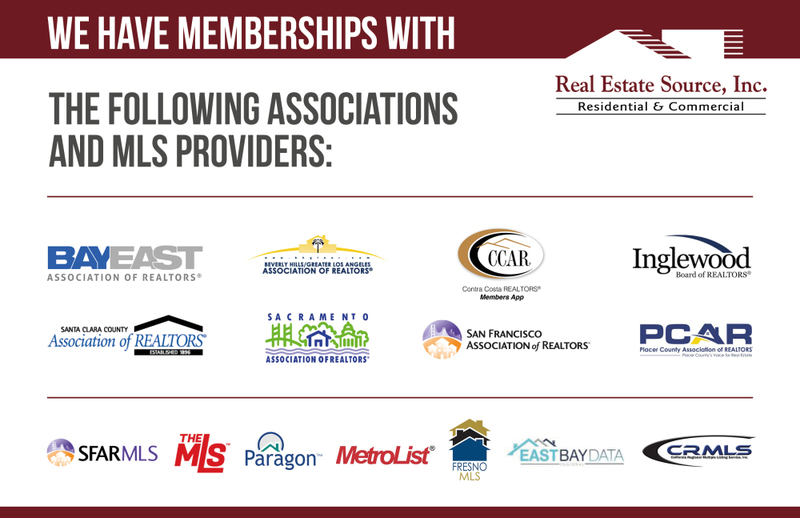 Real Estate Source, Inc. is actively looking to continue the expansion of our membership throughout California. Due to our large number of members, we are able to market our listings directly to a vast radius of agents and clients. Your clients are buying and selling their homes with you because they trust you. You have been able to satisfy their needs and that was not accomplished because of your brokerage name brand. The National Association of Realtors conducted a study on how buyers and sellers choose their real estate agents and the results showed that only 4% of consumers choose their agent based on the brokerage's name brand or by walking into a real estate office based on its brand recognition. A staggering 90% of consumers were mostly concerned with honesty, trustworthiness, and the reputation of their agent. This study calls into question the value of belonging to a big “brand name” brokerage and casts doubt on their claims that real estate agents will be more successful if they join a brokerage because it has a “recognizable name." This study reinforces what Real Estate Source, Inc has been stating since it was founded. For over a decade, Real Estate Source, Inc. has been educating real estate agents and empowering them with the knowledge and understanding that they hold the keys to their own success, regardless of the brand name they carry. 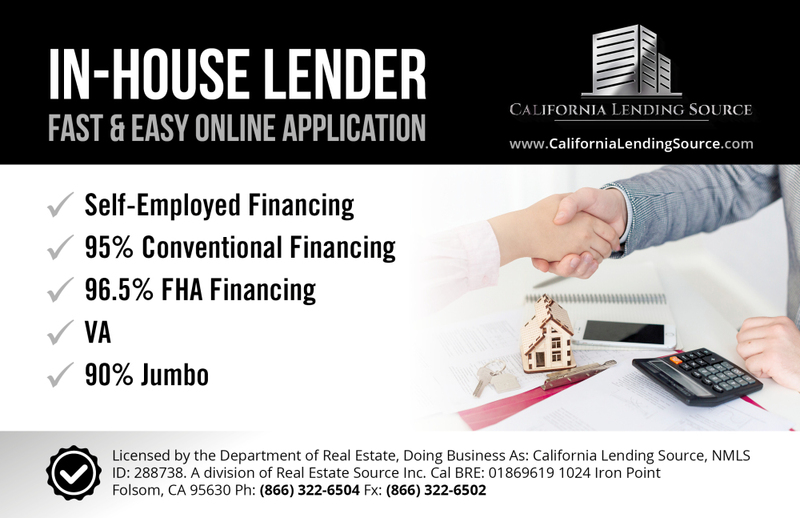 Unlike most lenders, California Lending Source is able to offer a solid, preliminary approval within the first week of a mortgage application with our in-house underwriting expertise. The regulations for mortgages change so frequently that having our underwriter in the office helps us start the loan process on the right foot, leaving less chance to stumble with a denial three or four weeks into the process. Receiving a late denial could mean finding a different method of finance or losing out on a sale. At California Lending Source, you can expect a preliminary approval email in just a few business days! Our wholesale underwriter reviews your clients loan application, credit report, income, financial statements, and tax returns early in the process. By offering this service so early, we can expedite the loan process by alerting the underwriter to possible issues from the beginning. Our loan officers are available 24/7 for questions and advice. At California Lending Source, we realize that every situation is unique and some may need specialized solutions, which can only be resolved by an underwriter. Having one in-house saves you and clients time, money, and aggravation. Experience the difference at California Lending Source. Real Estate Source, Inc. has a corporate office located at 1024 Iron Point Rd. Folsom, CA 95630. We have office space & meeting rooms available if our agents need to meet with clients and you can also gain access to over 1,000 locations throught the United States. Think Real Estate Source, Inc. would be a good fit for you and your real estate business? Visit our HOW TO JOIN page to download/review our contract to get started today! 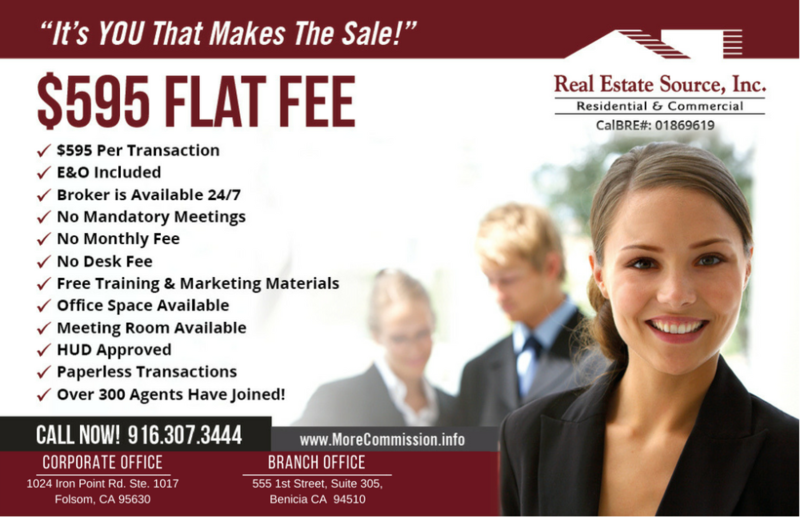 Real Estate Source, Inc. "Why Join"